I stopped myself from writing this straight after the game because it would have been 500 words of a personal attack on our favourite referee, and may have been slightly biased! First things first, credit to the best footballing team I have ever seen. Barcelona are amazing, and just keep the ball so well. When they lose it (which is not very often) they press the ball so well that they get it back nearly immediately. Every time we got the ball, they swarmed all over us, and inevitably retook possession. I really respect that Barcelona will never change their philosophy - why would you if you have players like Messi, Xavi, Villa etc? What a player Messi is, when the ball is at his feet and his running at you, it is one of the most scariest things in the world! As for Arsenal, where can we start? Of course the sending off made it an impossible task and it was really all down hill from then. People keep telling me how Arsenal had no shots on target but until roughly 30 minutes before the end of the tie, Arsenal were going through. Barcelona were all over us, but as we Arsenal supporters know all too well, it’s one thing dominating a game and having plenty of shots on target, but it’s another thing actually converting those chances in to goals. The argument that some have made is that Robin Van Persie’s dismissal did not affect the outcome as Arsenal would have lost the tie anyway. However at 1-1 on the night, the Arsenal players will have realised that they only needed to score one more goal in the remaining 30 minutes of the tie (or hour if you include extra time), and Barcelona would have had to score 3 goals. But when the ref sent off Van Persie, that allowed Sergio Busquets to move forward in to his normal position in midfield which gave them an extra player in the middle of the park – how could that NOT have made a difference? Also, at the other end earlier in the match, Messi was ruled offside but took his shot after the whistle blew – why didn’t he get booked as well? The sending off was just ridiculous and anyone with half a football brain knows it. In a stadium with over 90,000 Barca supporters and probably just as many whistles in the crowd, it would have been impossible for Van Persie to know for sure whether he was offside in the one second between the ref’s whistle blowing and him taking the shot. Even if he heard the whistle, his body was already in motion, and it wasn’t like he tried to smack the ball out of the ground to waste time. Surely common sense should have prevailed? The letter of the law tells the ref to book a player that wastes time, but this was not time wasting, Robin did not know if he was onside or not so he took the shot. Imagine if the flag had stayed down and he had stopped - he would have been slated! What is the bloody point of a 5th official? Surely the referee could have asked him if he heard the whistle because I am convinced he would have said ‘NO!’. Even the Linesman who was in line with Robin wasn’t even asked, I do not see the bloody point of a lineman or a 5th official if they are not even used! Perhaps the decision would not have affected the outcome of the tie, but who knows? 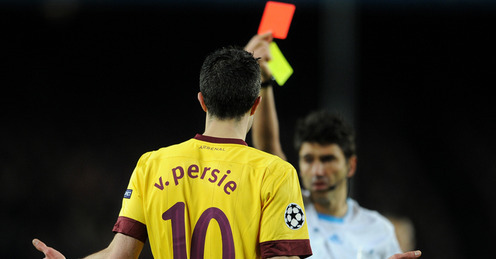 The fact remains that when RVP got sent off, Arsenal were leading the tie. For me, it was a non-decision; there would not even have been a debate about it. It’s not as if the actual offside decision was contentious, or that it was a bad tackle or something that would have caused post-match debate - everyone just expected the game to carry on, and if the ref had not booked Van Persie then no one would have batted an eye lid. I think tactically something had to be done too. We let them have the ball in their area too much and I thought if we pressed them more, they may have had to do something different. It may not have worked but listening to Spanish experts, that seems the way to play against them. After Robin was sent off, we had no outlet and no one up front to hold it up and that meant the ball just kept coming back towards the Arsenal defence. The few times we did get it to Nasri, he was alone and there was no one up front to help him out or anyone for him to aim for either. Instead of bringing Arshavin on, I thought bringing Bendtner on and then maybe even Chamakh would have been the better option. We missed the pace of Theo Walcott too; perhaps he could have given us the forward thrust we were desperately missing. I don’t think any Arsenal supporter will argue that Barcelona were the better team over two legs and deserved to win - however, the best teams do not always win. Arsenal supporters will remember that game against West ham (15 plus shots on target, West ham had one and won the game 0-1) or the game in Europe against CSKA Moscow (when we had many, many shots but the game ended 0-0). So the stats may back up Barcelona (as they usually do) but three quarters of the way through the tie, Arsenal were leading so to lose it is so disappointing. There is no shame going out to Barcelona but we were ONE goal away from knocking them out. I put a few quid down on the score ending 3-2 to Barcelona and perhaps if Robin had stayed on the pitch, it may have happened. It only takes a minute to score a goal; Nasri’s positive run brought a corner which then brought a goal, and what’s to say that may not have happened again? The bright note from last night once again was Jack Wilshere; he yet again stood up and gave it his all. Jack seems to care who he is playing against and just gives it his all. Koscielny and Djourou also put in very positive performances, and Almunia was quite simply superb. There was some Cesc bashing too but he just had a bad game. Yes, playing in Barcelona (where he is from!) may have affected him but to question his commitment and mindset was a little unfair - he just had a bad game! It happens to everyone. Perhaps the fitness issue affected him a little too. Arsenal must respond on Saturday now. It is now a huge game and Manchester United have their European game next week where as we have a week’s rest. Hopefully Sir Alex may rotate his squad over the next two games. So a trip to Old Trafford looms on Saturday and we have to just hope for the best. The Barcelona tie is now over, but you can’t help but think, if only Robin had stayed on…there are no guarantees Arsenal would have scored or gone through but there are no guarantees that Barcelona would have either.